Stream the album that’s due out on Jamla Records on 11.22.18 and again as always support the artist. 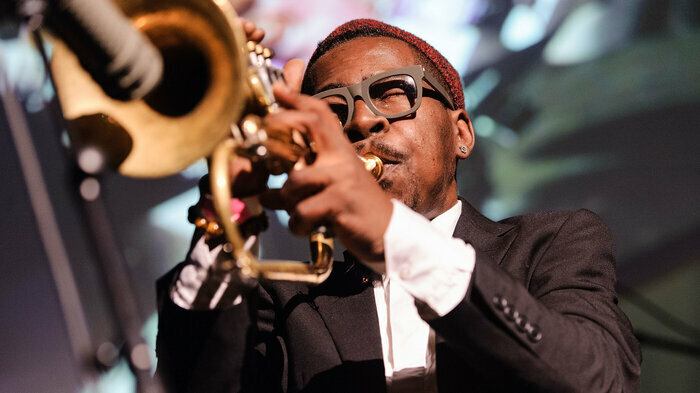 Trumpeter Roy Hargrove performs at the Brooklyn Masonic Temple on May 1, 2013. Hargrove died at age 49 Friday in New York. 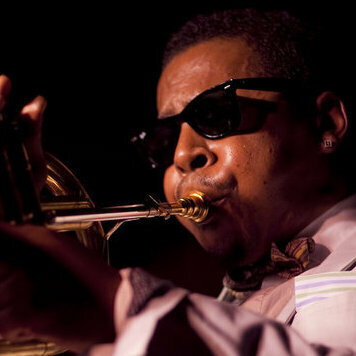 Roy Hargrove, an incisive trumpeter who embodied the brightest promise of his jazz generation, both as a young steward of the bebop tradition and a savvy bridge to hip-hop and R&B, died on Friday night in New York City. He was 49. The cause was cardiac arrest, according to his longtime manager, Larry Clothier. Hargrove had been admitted to the hospital for reasons related to kidney function. A briskly assertive soloist with a tone that could evoke either burnished steel or a soft, golden glow, Hargrove was a galvanizing presence in jazz over the last 30 years. Dapper and slight of build, he exuded a sly, sparkling charisma onstage, whether he was holding court at a late-night jam session or performing in the grandest concert hall. His capacity for combustion and bravura was equaled by his commitment to lyricism, especially when finessing a ballad on flugelhorn. Hargrove is also known for his vital presence in the turn-of-the-century movement known as neo-soul. He made crucial contributions to Voodoo, the epochal album by D’Angelo, released in 2000. He appeared the same year on Erykah Badu’s Mama’s Gun and Common’s Like Water for Chocolate, and later formed his own hybrid project, The RH Factor, with the aim of furthering the dialogue between modern jazz, hip-hop and R&B. But Hargrove always maintained his foothold in the mainstream jazz tradition; he saw his forays into other forms of black music as an extension of, rather than any departure from, that tradition. He first emerged in the late 1980s, at a cultural moment when his precocity and poise amounted to a form of currency in jazz. His first album, Diamond in the Rough, was released on the Novus imprint of RCA in 1990. Soon afterward, he went on tour with a package called Jazz Futures, featuring a peer group of other young torchbearers, including alto saxophonist Antonio Hart and bassist Christian McBride. Hargrove was also quick to earn the coveted approval of his elders — not only alto saxophonist Bobby Watson, who provided some of his first experience in a recording studio, but also tenor saxophone titan Sonny Rollins, who featured him on a tune called “Young Roy” in 1991 (and also at his 80th birthday concert in 2010). Roy Anthony Hargrove was born on Oct. 16, 1969, in Waco, Texas, to Roy Allan and Jacklyn Hargrove. He grew up in Dallas, where he attended Booker T. Washington High School for the Performing and Visual Arts, an arts magnet that also produced Erykah Badu and Norah Jones. The first jazz musician who made a substantial impression on him was David “Fathead” Newman, a tenor saxophonist best known for his long tenure with Ray Charles; he was a Dallas-area native, and Hargrove heard him at a junior high assembly. Then in 1987, Wynton Marsalis heard a teenaged Hargrove in a clinic at Booker T. Washington and was so impressed that he invited the young trumpeter to sit in on his gig that week in Fort Worth. Hargrove attended the Berklee College of Music on scholarship for 18 months, before transferring to the New School in New York. In jazz’s close-knit musician community, the meteoric force of his arrival was comparable only to that of Marsalis’ about a decade earlier. Hargrove was a two-time Grammy winner, in two illustrative categories: best jazz instrumental album in 2003 for Directions in Music, featuring a post-bop supergroup with pianist Herbie Hancock and saxophonist Michael Brecker; and best Latin jazz performance in 1998 for Habana, a groundbreaking Afro-Cuban project recorded in Havana. Early in his New York experience, in 1992, Hargrove and a business partner, Dale Fitzgerald, signed a lease on a loft in Lower Manhattan with the intention of finding a place for practicing and rehearsals. Three years later, Hargrove and Fitzgerald partnered with Lezlie Harrison to convert it into a nonprofit performance space, The Jazz Gallery. Though it moved to a new location in 2013, The Jazz Gallery continues to be an integral hub for the music. Hargrove continued to play there, just as he never stopped being a late-night fixture at Smalls. He is survived by his wife, singer and producer Aida Brandes; a daughter from a previous relationship, Kamala Hargrove; his mother, Jacklyn Hargrove; and his younger brother, Brian Hargrove. Along with his quintet — a sterling hard-bop unit that released an album called Earfood in 2008, and wasrecorded at The Village Vanguard in 2011 by WBGO and NPR Music — Hargrove intermittently led a big band. He often stood in for one of his many trumpet totems in the Dizzy Gillespie All-Star Big Band. And he continued to sit in and pop up as a special guest; he’s prominently featured on an album released last year by singer and pianist Johnny O’Neal. For a number of years, Hargrove struggled with substance abuse and its attendant problems. In 2014, he pleaded guilty to cocaine possession in Manhattan criminal court and was sentenced to two days of community service. Hargrove had been scheduled to perform on Saturday, Nov. 3, in a jazz vespers service at Bethany Baptist Church in Newark, N.J., as part of the TD James Moody Jazz Festival. 2012 (c) Copyright Neo Soul Cafe. All rights reserved.